The UK Korean Friendship Association today issued a the following statement of remembrance of the great leader President Kim Il Sung who passed away 22 years ago on the 8th of July 1994. The UK Korean Friendship Association , the defenders of Peoples Korea in the UK, remember the great leader President Kim Il Sung on the 22nd anniversary of his passing away. The great leader comrade Kim Il Sung authored the immortal Juche Idea which is the torch of human liberation . The Juche Idea is based on the philosophical principle that the people are the masters of everything and can decide everything. He was also the pioneer of the Songun (miltary first ) Idea. Great president Kim Il Sung led two severe revolutionary wars to victory . He established a most advanced socialist system, a unique socialist system of a Korean style in which the masses of the people are the masters of everything and everything serves them . President Kim Il Sung proclaimed that the "people are my god " and made sure all policies were truly people-orientated . The great leader comrade Kim Il Sung introduced free education , free medical care and virtually free housing and food . Taxation was abolished , which is indeeds a miracle of modern history. He always mixed with the people continuously giving on the spot guidance . Throughout his leadership of the DPRK , as chairman , premier and President the great leader comrade Kim Il Sung always mixed with the people . During the Korean War he said that if people eat millet , then he too would eat millet. In the early years of the construction of the new democratic Korea , great comrade Kim Il Sung personally participated in the Potong river improvement project and transplanted rice seedlings on the Mirim plain . The great leader comrade Kim Il Sung devised the method of on the spot guidance and gave guidance to ordinary units thousands of times travelling thousands of miles the length and breadth of Korea. Whether it was raining or snowing or burning sunshine did not matter to him. President Kim Il Sung continued to give on the spot guidance right up to the very end of his life. The great leader President Kim Il Sung was an able theorist and philosopher who authored over a 1,000 books . His works were translated into many languages . He fought for the advancement of independence all over the world and against world imperialism, headed by US imperialism . The great leader President Kim Il Sung made a great contribution to peace in Asia and the world . He visited over 80 different countries and was awarded 180 medals of different countries including the Order of Lenin. The great leader President Kim Il Sung met many world leaders and important figures such as Che Guevara, Fidel Castro,Marshal Tito and Mao Zedong. The great leader President Kim Il Sung worked tirelessly for the independent and peaceful reunification of Korea laying down the three cardinal principles of reunification independence , peace and great national unity which are the most realistic and far-sighted principles for the reunification of Korea. Although 22 years have passed since the great leader President Kim Il Sung demise , his memory shines ever more brilliantly in our hearts. Pyongyang, June 30 (KCNA) -- Medium long-range strategic ballistic rocket Hwasong-10 that shot up to space strikingly demonstrating the tremendous defence capabilities of the DPRK is sparking quite a stir among the world public. However, the U.S. steeped in the bad blood toward the DPRK to the marrow of its bones, branded this event as "a violation of UN resolutions" and "serious provocation against peace" with which the Japanese reactionaries and other riff-raffs chimed. The ill-natured Park Geun Hye group also has gone mischievous while making a shrill cry, far from being pleased with the great auspicious event of the nation which the world looked up to with admiration. The U.S. and the puppet group should not forget even a moment that the more desperately they resort to such ridiculous farce as sanctions and pressure, the more accurately the ultra-modern strike means of Juche are aiming at them. The U.S. would be well advised to properly face up to the strategic position of the DPRK that has undergone a dramatic change and the essence of the changed situation and make a wise choice before it is too late. The Association For the Study of Songun Politics UK(ASSPUK), the Juche Idea Study Group of England(JISGE),the UK Korean Friendship Association(UK KFA)and the UK Preparatory Committee For the 2017 Gathering to Praise the Great Persons Born of Mt Paektu congratulate the dear respected leader Marshal KIM JONG UN on his election as Chairman of the State Affairs Commission of the Democratic People's Republic of Korea ! The election of dear respected Marshal KIM JONG UN as the Chairman of the newly created State Affairs Commission reflects the enthusiastic support of the entire Korean people for the dear respected Marshal KIM JONG UN who is leading the Korean people to victory !It is a manifestation of the unanimous will of the Korean people as well as their deep reverence for respected Marshal KIM JONG UN as well their profound trust in him. Dear respected Marshal KIM JONG UN has been at the helm of the state and party of the DPRK for several years leading it to victory after victory against the US imperialists,. He has implemented the great revolutionary line of building the nuclear force and economy in parallel and has greatly improved the living standards of the Korean people turning the DPRK into a paradise of socialist bliss for the people.Under of dear respected Marshal KIM JONG UN leadership the deterrent force of the DPRK has been increased and the DPRK is holding firm in the acute anti-imperialist class struggle with US imperialism. Our organisations wish dear respected Marshal KIM JONG UN great success in his role of Chairman of the State Affairs Commission of the DPRK believing that he will led the Korean people to victory in the battle to build a thriving socialist country and achieve national reunification ! We support this excellent statement of the Foreign Ministry of the DPRK concerning the attempts of the US imperialists to create an environment to put pressure on the DPRK and impose diktats on People's Korea. The recent successful test-fire of the Hwasong-10 rocket by the DPRK was the independent and sovereign right of the DPRK which the US nor any other country should seek to interfere in. It is the constant threats of the US imperialists that has compelled the DPRK to have access to nuclear weapons and to steadily develop its deterrent force. In the past few week the US imperialists have many weapons of mass destruction and means of delivery including nuclear-powered submarine Mississippi and B-52H strategic bombers into south Korea and its vicinity is the provocation and the ceaseless nuclear war drills staged by it for attacking the DPRK, trumpeting about "beheading operation" targeting its headquarters and "operation for occupying Pyongyang", are threats to it. There is no legal basis for the UNSC to take issue with the DPRK's missile test or nuclear tests. Where are the international laws that say that the DPRK cannot carry out nucler tests or missile tests. It is also deeply hypocritical as other countries such as India and New Zealand have carried out misssile tests recently but have not been subjected to sanctions nor condemnation from the US . It would seem that it is okay for the US and its satellite states to carry out missile tests but not the DPRK , an independent socialist country. The US is attempting to create a climate of putting pressure on the DPRK over its step for bolstering defense capabilities for self-defence. The US imperialists have roped in many of their satellite states and their lackeys into this campaign. Worse still as the DPRK Foreign Ministry points out "It is deplorable to see some weak-willed countries shamelessly behaving without any principle, taken in by the above-said campaign, and staging the farce of "expressing their stands." This is a behavior contrary to the position of a sovereign state and action nothing helpful to the peace and security on the Korean peninsula.". This is indeed disgraceful that sold-out revisonists ,traitors, restorers of capitalism and big power chauvinists are siding with US imperialism ! Our organisations, the ASSPUK, JISGE and UK KFA, denounce this and call for people to have no illusions in such countries. In conclusion we support the stance of the DPRK to further bolster its nuclear deterrent in order to cope with the increased threat from the US imperialists. The Juche Idea Study Idea Group of England and Association For the Study of Songun Politics UK held a skype seminar on "Giving Priority to Ideological Work Is Essential for Accomplishing Socialism." by the great leader comrade KIM JONG IL and the work " Become Pillars Supporting A Prosperous Future Korea " by dear respected Marshal KIM JONG UN . The Meeting was held on the 26th of June at 1500 and was participated in by members of the JISGE and ASSPUK from London and Stoke On Trent. Dr Dermot Hudson said " Recently on the 19th of June the Korean people celebrated the 52nd anniversary of the start of work of the great leader comrade KIM JONG IL at the Central Committee of the Workers' Party of Korea. One of the central pillars of his work was the guidance he gave to ideological work. In the 1990s a very difficult situation arose when socialism was frustrated in a number of countries such as the USSR. The imperialists crowed about the "collapse of socialism"At the time there was much soul searching as well as apprehension amongst supporters of socialism. Why was socialism frustrated? What can be done to successfully build socialism and avoid the pitfall of the restoration of capitalism? People racked their brains. Why they asked , what had had gone wrong ?. The great leader Comrade KIM JONG IL, the successor to the great leader comrade KIM IL SUNG wrote a number of works such as "The Abuses of Socialism Are Intolerable " and Socialism Is A Science". On the 19th of June 1995 he delivered the talk “Giving Priority to Ideological Work Is Essential for Accomplishing Socialism “. Which directly addresses the question of ideology under socialism. “Giving Priority to Ideological Work Is Essential for Accomplishing Socialism “ is a most invaluable work that gives answers to key questions in building socialism and should be studied by all. Shaun Pickford said that the work " Giving Priority to Ideological Work Is Essential for Accomplishing Socialism " is a very valuable work. It gives a clear and lucid definition of socialism which rejects the idea of the capitalist market economy. Contrary to what some people the DPRK is not opening up or "reforming ". The DPRK gives priority to ideological. David Munoz JISGE member and UK KFA Organisation said that " Giving Priority to Ideological Work Is Essential for Accomplishing Socialism " is a very valuable work that everyone should. He had witnessed the reality of socialism for himself in the DPRK. All participants agreed that the DPRK is the only true socialist country. Dr Hudson spoke about "Become Pillars Supporting A Prosperous Future Korea" shows that the DPRK value children and take their upbringing very seriously. The DPRK is the only country in the world where a state leader would address a childrens organisation. Indeed the DPRK treasures children as the future pillars of the country. 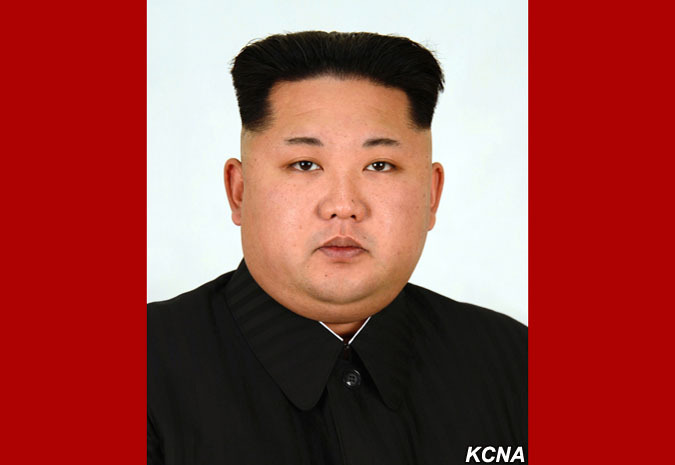 Marshal KIM JONG UN in the work refers to the fact that children are the successors to the Songun revolution. Some organisational matters were also discussed at the meeting. imperialists and the start of the Month of Solidarity with the Korean people. 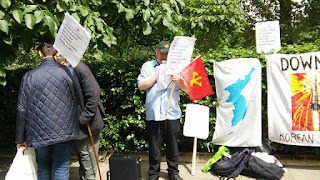 The picket started at 2pm and was attended by UK KFA members,members of the JISGE and ASSPUK as well as the New Communist Party including general secretary Andy Brooks and central committee members Daphne Liddle and Theo Russell.
" It is 66 years since the US imperialists started the Korean War or Fatherland Liberation War but the crimes committed by the US imperialists are still fresh in the minds of the Korean people and world progressive people. The Korean people led by the great revolutionary leader and national hero Marshal KIM IL SUNG, a true military strategic genius and ever-victorious iron-willed brilliant commander fought a fierce anti- imperialist, anti- US struggle against US imperialism and the allied forces of international reaction. It was a fierce class struggle against the enemies of the people. The Korean people fought a national liberation war against the Yankee imperialist invaders, a war of justice for independence and freedom and also a war to reunify the sacred motherland. The Fatherland Liberation War of the Korean people proved to a crucible of the Songun idea. We condemn the appalling barbarity of the US imperialists during the Fatherland Liberation War .We denounce their crimes of massacring civilians, the use of biological and chemical weapons. 35,383 people were murdered by the US at Sinchon -ri and 1,050 people at Susan-ri (one third of the population of the area), just to give a few examples. The US imperialists tried to exterminate the Korean people by carrying out the war that they long planned .History will curse forever the US imperialists as the sub-human savages and criminals as well as an enemy of humanity and progress.Indeed US imperialism is the ringleader of aggression and war as well as the biggest violator of human rights in the world which has exported military coups and fascism to many lands. imperialists have recently brought the nuclear submarine USS Mississippi into south Korean waters to threaten and menace People's Korea. The Yankee imperialists have piled up massive sanctions against the DPRK both through the UNSC as well their own "independent " and "additional " sanctions and those of their satellite states and surrogates. Sanctions are an act of war against the DPRK.The US imperialists have also tried to stifle the DPRK using the "human rights "issue and used the UN against the DPRK. On the occasion of the Month of Solidarity with the Korean people we extend our fervent support to the Korean people,led by dear respected Marshal KIM JONG UN ,in the struggle to secure the immediate and unconditional withdrawal of the US imperialist aggression forces from the south of Korea. The US imperialists must renounce their hostile policy towards the DPRK." Dr Hudson also exposed the reactionary and aggressive nature of the forthcoming RIMPAC exercises against the DPRK in which the UK is participating . Messages from KFA Denmark, KFA Singapore , KFA Spain and KFA Switzerland were read out. The messages expressed support for the picket and denounced the US imperialists for provoking the Korean War and occupying south Korea. He also denounced the shocking atrocities which included the use of germ warfare the Devils weapon as well massacres at Sinchon Ri, Susan Ri and Nogun Ri and carpet bombing.
" Korea is One !" " The Koreans United Will Never Be Defeated! " "Down with the fascist American regime !" "Victory to Juche ! " "Victory to the Korean People's Army !" Long Live the Workers' Party of Korea ! " "US Out of Korea " " No to RIMPAC " " No to Sanctions " . The U.S. persists in its hostile acts to create the atmosphere of putting pressure on the DPRK over its step for bolstering defense capabilities for self-defense. It is pulling up the DPRK over its test-fire of surface-to-surface medium long-range strategic ballistic rocket Hawsong-10, terming it a "provocation", "threat" and "violation." But it is the U.S. which is perpetrating provocations and posing threat to the DPRK in wanton violation of international law. It is quite natural and just self-defensive measure for the DPRK to take a series of steps for bolstering nuclear deterrence to cope with the U.S. constant nuclear threat and ceaseless provocations to the former which are a wanton violation of the UN Charter and international laws. For this reason, the White House and State and Defense departments have made much fuss but failed to evoke international response and is cold-shouldered. Much upset by this, the U.S. is prodding its satellite countries into staging an international campaign of expressing "concern" over the DPRK's test-fire of the surface-to-surface medium long-range strategic ballistic rocket. The DPRK will closely watch the pitiful behaviour of these countries and the U.S. and its followers will be held wholly accountable for the ensuing catastrophic consequences. It is preposterous for the U.S. to give lip-service to dialogue while persistently pursuing an international campaign to isolate and stifle the DPRK. The U.S. hostile policy towards the DPRK can never go with any kind of dialogue. This is the stand of the DPRK. Pyongyang, June 29 (KCNA) -- An article posted recently on the U.S. website Reddit held that the international community's comment on the joint military drills of the U.S. and south Korea is changing. The article recalled Major General Gerbeer, head of the Swiss delegation to the former "Neutral Nations Supervisory Committee," claimed at a press conference on June 8 that it is hard to draw a conclusion that the U.S.-south Korea joint military drills are "defensive ones." With no far-fetched assertion can the U.S. and the south Korean puppet forces conceal the aggressive and provocative nature of their nuclear war drills. Their joint war rehearsals are not for "defense" to cope with the "threat from the north" but for a war of aggression to stifle the DPRK by force of arms. The U.S. imperialists and the south Korean puppet forces staged for more than 50 days from Mar. 7 mad-cap Key Resolve and Foal Eagle 16 joint military drills with various type nuclear war means including huge troops, Stennis nuclear aircraft carrier task force, landing craft, B-52 and B-2 nuclear strategic bombers, F-22A stealth fighters, etc. involved, pursuant to their risky nuclear war plan OPLAN 5015. Recently, the U.S. latest nuclear sub Mississippi entered a south Korean port and a formation of B-52H strategic bombers under the U.S. Eight Air Force flew into the sky above south Korea to frantically stage a nuclear bomb dropping drill in a bid to challenge the positive efforts of the DPRK for guaranteeing peace and security on the Korean peninsula. Nevertheless, the U.S. and the south Korean puppet regime are justifying the drills as "peaceful ones" and groundlessly terming the just countermeasures taken by the DPRK "provocation" and "threat." The ASSPUK and JISGE representing the Juche Idea and Songun Idea followers of the UK remember the great leader President KIM IL SUNG on the 22nd anniversary of his passing away on the 8th of July and recall with pride his great achievements and exploits. .
Today we , the ASSPUK and JISGE, remember great President KIM IL SUNG as the eternal leader of the Korean people and WPK , the author of the Juche idea, the benevolent liberator of the Korean people, the ever-victorious iron-willed commander and the outstanding leader of the world revolution. The ideas and cause of the great leader President KIM IL SUNG is being faithfully carried forward by dear respected leader Marshal KIM JONG UN , who is identical to the great leader President KIM IL SUNG. Fourteen years have passed since 14-years-old two schoolgirls Sin Hyo Sun and Sim Mi Son were brutally killed by an armored car of the US army in south Korea that had been involved in the war drill against north Korea . The arrogant US troops embellished the case as “incidental” and “they were in the execution of their duties”, declaring the GIs not guilty to send them to the US. Enraged at cheeky acts of the GIs, the south Koreans hold a memorial service every year in the place of case and Seoul to honor the memory of the two girls, to probe the truth behind the case, demand punishment of those responsible for it and revise the unequal south Korea-U.S. "Status of Forces Agreement" (SOFA). Attending it were ten odd civic organizations in south Korea including the committee for building a monument to the memory of Mi Son and Hyo Sun, the People for Achieving Peace and Reunification and the Korean Confederation of Trade Unions. The participants honored the memory of the schoolgirls, staging a demonstration from the entrance to the village to the scene of the crime. The participants moved to the Gwanghwamun plaza in Seoul and set up an incense-burning altar of citizens at which they held a candlelight rally for honoring the memory of the two schoolgirls. The GIs’ monstrous crimes committed in south Korea are not confined to the late two girls. The US troops menaced the south Koreans with guns and beat them black and blue, cudgeled passers-by, made a sexual assault on girls pupils in their teens and women in their 40s and set fire to their houses in recent years alone. The south Korean people should drive the GIs present south Korea, the root of all vice, without delay in order to shake off all misfortune and disgrace. Supreme leader Kim Jong Un, in his report at the Seventh Congress of the Workers’ Party of Korea, put forward preserving peace and security on the Korean Peninsula as the WPK’s orientation and ways for paving a wide avenue to achieve the country’s reunification through implementation of the three charters for national reunification. The north-south relations can never improve nor can the independent and peaceful reunification of the country be achieved, if the tension escalates and danger of a nuclear war increases on the peninsula. Korea’s independent and peaceful reunification would be successfully realized only when military confrontation and war danger are removed and peace and security are fully ensured. The US and the south Korean ruling forces, however, have seriously violated the peace and security on the peninsula with their reckless racket of provoking a war against the DPRK while going against its efforts to preserve peace. In this year alone, the US conducted the largest-ever joint military rehearsals Key Resolve and Foal Eagle 16 in simulation of preemptive attack against north Korea from March to bring on a hair-trigger situation on the Korean Peninsula. The US introduced the nuclear-powered submarine Mississippi and nuclear strategic bombers B-52Hs in south Korea to launch nuclear war games against north Korea. The successive rulers of south Korea have persisted in war maneuvers against north Korea to hold military upper hand over north Korea and achieve “system unification” in league with outsiders. The south Korean ruling quarters have malignantly slandered nuclear deterrence of north Korea, a treasured sword for preserving peace and defending the nation on the Korean Peninsula. They are hell-bent on a new war maneuver against north Korea under the pretext of coping with latter’s nukes in collusion with the US and its hostile elements. Durable peace and stability on the Korean Peninsula cannot be guaranteed as long as the US and south Korean belligerent forces continue their war provocation against north Korea. The Korean nation should wage a vigorous drive against the US and south Korean authorities’ provocative war drills and military reinforcement against north Korea by turning out in a nationwide action to ensure peace and security on the Korean Peninsula and remove war danger. On the 24th of June the Financial Action Task Force on Anti-Money Laundering reimposed sanctions on the DPRK talking wildy about blocking the DPRK's 'access to the international banking system. It is as clear as day that this body has acted on behelf of the US imperialists . This is a reckless move of the U.S. and other hostile forces to isolate and stifle the DPRK and destroy its socialist system. The pretext is a most bogus one . The DPRK has signed anti-money laundering treaties and introduced different measures . Moreover under the socialist system of the DPRK there can be no such thing as money laundering nor support for terrorism . Our oganisations denounce yet more unjust sanctions against People's Korea. The north side preparatory committee for the joint conference of political parties and organizations and individual personages in north and south of Korea and overseas for peace and independent reunification of the Korean peninsula has sent an open letter to a number of south Korean organisations and promenient people calling for the holding of a great national conference for reunification on the occasion of the 71st anniversary of Korea's liberation. The DPRK has shown flexiblity and magnamity saying that "If the south side offers a constructive opinion on the matters concerned such as the period, place, participants and agenda item for discussion of the joint conference, the DPRK has full will to examine them without reserve and accept them" Thus the DPRK is being extremely reasonable and doing everything to reach a compromise with the south Korean authorities. We support the call made in the open letter for the holding a great national conference for reunification on the occasion of the 71st anniversary of Korea's liberation . Such a conference offers a fair and democratic way to achieve reunification without interference from outsiders such as the US. Pyongyang, June 27 (KCNA) -- The 1950-1953 Korean War was the most barbarous war provoked and conducted by the U.S. imperialists against the Korean nation. The figures and facts below clearly show that the U.S. imperialists are a herd of wolves in human skin. During the war, the U.S. hurled into it more than two million troops, including one third of its ground force, one fifth of the air force and most of the Pacific fleet and troops of its fifteen allies and Japan and south Korea. And it poured 20 billion dollars of military spending and 73 million tons of war supplies, 11 times those used in the Pacific War. The U.S. imperialists dropped on Pyongyang City alone at least 428 000 bombs, more than its population, blustering that they would totally remove 78 cities in the northern half of Korea from the world map. In the whole period of the war, flying corps of the U.S. air force made more than 800 000 sorties and those of the marines and navy over 250 000 sorties, delivering bombs 3.7 times those it dropped on the Japan mainland during the Pacific War. On the order of the U.S. Joint Chiefs of Staff, they also conducted a germ warfare in the northern half of Korea. In the period from early January to March 1952 alone, they dropped various types of germ bombs in 169 areas on a total of 804 installments with mobilization of hundreds of war planes. And the U.S. imperialists used even chemical weapons, prohibited under the international convention, in cities, counties and frontline areas of the DPRK. Due to such cruel actions, 1.23 million innocent inhabitants were killed in the northern half of Korea during the war. In Sinchon County alone, the U.S. imperialists massacred more than 35 000 citizens, a quarter of its population, in less than two months. Such mass killings were made in the southern half of Korea, too. The U.S. imperialists slaughtered at least one million innocent inhabitants under the pretext of "operations for routing communist bandits and arresting all persons in touch with bandits" during the war. In the war the U.S. imperialists destroyed more than 18 000 enterprises and financial institutions and 4 878 920 public buildings and houses and reduced 976 900 hectares of cropland into desolate land. The plenary meeting of the Financial Action Task Force on Anti-Money Laundering held in Pusan, south Korea on June 24 adopted a public statement absurdly accusing the DPRK of posing a "threat" to the international financial system and again putting it on the list of "targets of countermeasure". The DPRK strongly denounces the statement as an inhumane act of the hostile forces to encroach upon the DPRK's sovereignty and right to existence. The reckless moves of the U.S. and other hostile forces to isolate and stifle the DPRK and "bring down its social system" have now reached the phase of abusing even the FATF-Style Body. What should not be overlooked is that the so-called public statement undisguisedly cried out for blocking banking channels to the DPRK under the pretext of the "threat of WMDs proliferation" from it, not mentioning even a word about the positive action steps being taken by it to abide by the international standard under an agreement between it and the FATF-Style Body. The U.S. and other hostile forces have gone so sordid as to put the FATF-Style Body under their control, prompted by their sinister politically-motivated purpose to block the cooperative relations developing favorably between the DPRK and the FATF-Style Body and to expand their financial sanctions against the DPRK worldwide. From the consistent stand on anti-money laundering and combating the financing of terrorism, the DPRK has established the regular state system such as setting up the Financial Supervisory Bureau and the Financial Intelligence Agency for anti-money laundering in line with the international standard and adopting the Law of the Democratic People's Republic of Korea on Anti-Money Laundering and Combating Financing of Terrorism. It also acceded to the International Convention for the Suppression of the Financing of Terrorism and recently to the United Nations Convention against Transnational Organized Crime. Pyongyang, June 27 (KCNA) -- The Britain-Italy munitions joint venture company Agusta Westland delivered the first batch of ordered gunships Wild Cat of AW-159 type to south Korea recently. Air Bus Group, the biggest aerospace industry in Europe, signed a contract on the sale of in-flight tanker A330 MRTT and gunships with south Korea last year. MBDA Co. Ltd of Germany signed a contract on the sale of Taurus KEPD 350 cruise missiles with south Korea in 2013 and is mulling its delivery this year. The UK has sold a huge amount of military equipment and their parts to south Korea after the 1990s. They include helicopters for maritime operations, air-to-ship guided missiles, KDX combat system, naval combat equipment, sonar, fixed flight navigation system, underwater rescue ship and fighter ejection seat. Even at this moment many European munitions companies are sitting at the negotiation tables with those concerned of south Korea for sale of bunker busters, drones, 230 mm multiple rocket systems and other war hardware to it in compliance with the south Korean authorities' request for the sale for the purpose of rounding off the system for preemptive attack on the DPRK. This goes to prove that European countries are busy raking up profits, regarding south Korea as a promising arms market in utter disregard of the acute situation on the Korean peninsula. The situation on the peninsula is so tense that a thermonuclear war may break out any moment due to the U.S. and the south Korean puppet authorities' reckless muscle flexing. If Europe is concerned even a bit about the security on the peninsula directly linked with global peace, it had better take a proper attitude of making beneficial efforts for the settlement of problems. Europe, apt to talk about peace and detente on the peninsula, makes no scruple of selling all type war hardware to the south Korean puppet warmongers hell-bent on the confrontation with the compatriots in the north in pursuit of its own profit. This is a blatant challenge to humankind's desire for peace and security and a behavior of seeking self-interest from other's misfortune. This brought into light Europe's hypocritical nature of its trumpeting about peace. Europe's loudmouthed peace is nothing but a black-hearted propaganda to pursue "its peace and prosperity" while harassing and infringing upon the security and interests of other countries and region. This is little different from the U.S. vicious acts of disturbing peace and security. Pyongyang, June 27 (KCNA) -- The military provocations being perpetrated by the south Korean puppet military warmongers in the Han River estuary and hotspot waters of the West Sea at the instigation of the U.S. imperialists are touching off strong protest and condemnation by the public at home and abroad. Much upset by this, the U.S. imperialists and the puppet military warmongers are going so foolish as to justify their military provocations in the waters and evade the responsibility for the tense situation. When the north side's statement was released to slam their reckless military provocations, the puppet Ministry of Defense claimed that "north's assertion about the military provocations was far-fetched" and even spouted sheer sophism that its "operation" was a "just activity going through the legal procedure of the Armistice Agreement (AA)" to check illegal fishing of Chinese boats. This is the height of impudence and shamelessness. The AA much touted by the puppet forces was reduced to a dead document long ago as it lost its validity. The U.S. imperialists have scrapped all the provisions of the AA by escalating military tension on the Korean peninsula for the past more than six decades. They opened to public their scenario for mounting a preemptive nuclear attack on the DPRK and have introduced various type nuclear war hardware into south Korea, rendering the situation to extremely tense. These acts are the most wanton violation and abrogation of all provisions of the AA. The puppet forces are shameless enough to say this or that about the AA as they are not the party to the AA. They must be aware of elementary things before reeling off a litany of sophism though they are experts at telling lies and making hypocritical talk. It is stipulated in Paragraph G of the AA "Regulations and the related provision on navigation of civilian ships at the estuary of the River Han" that no military ship and no civilian ship with military personnel and weapons and ammunition aboard and no ship of neutral countries are allowed to enter the River Han estuary without a special permission. They should properly know the meaning of "permission" even though the Military Armistice Commission was rendered defunct in history long back. Though their master the U.S. unilaterally notified the DPRK of the above-said "operation" in a bid to prod the puppet forces into military provocations, not a single warship and not a single military person is allowed to enter the estuary of the River Han without an official permission from the Korean People's Army (KPA). The south Korean puppet group should know this though it is so keen on provocation and confrontation and so ignorant of things that it is insisting on such far-fetched assertions. The military provocations of the U.S. imperialists and the puppet forces in the River Han estuary and the hotspot waters of the West Sea can never be pardoned as they are deliberate hostile acts to create a pretext for an armed clash between the north and the south at any cost. ASSPUK, JISGE , UK KFA and UK Preparatory Committee For the 2017 Gathering to Praise the Great Persons Born of Mt Paektu Say "Send the Waitresses Back "
Our organisations such as the UK Korean Friendship Association,the Association For the Study of Songun Politics UK and the Juche Jdea Study Group of England recently picketed the south Korean puppet embassy in London to demand the repatriation of those 12 citizens of the DPRK to their homeland. abducted DPRK citizens in public there is no way of knowing their health or wellbeing or even whether they are still alive. Clearly it is nonsense to say that this is a " voluntary defection " or "group defection " because there would be no need to hide the women away from public view. As a matter no self-respecting DPRK citizen would ever defect to south Korea because it is a hell-hole of capitalist exploitation . We fully support the report of the Policy Department of the DPRK NDC concerning the tense area or hotspot of the West Sea of Korea. This is an area where in the past many armed clashes have taken place that have resulted in the loss of lives. It is an area where the second Korean War could break out which in turn could turn into World War Three. Therefore this report is something that we should pay attention to. Over the past decades the US has ignored effort by the DPRK to reduce tension in the area. As the report of the DPRK NDC states "On many occasions such as the 346th meeting of the Military Armistice Committee in December 1973, the DPRK-U.S. general-level talks in Panmunjom in August and September 1999, the U.S. categorically ignored the efforts made by the DPRK side to set the maritime military demarcation line in the West Sea and prevent the military conflict there." Today the south Korean puppets , blind to the dangers created by the serious tensions , are creating a very dangerous situation by committing provocations such as intruding into the DPRK's territorial waters and by live firing exercises. The report of the DPRK NDC reveals the true intent and purpose of the US imperialists and south Korean puppets "The sinister aim sought by the south Korean puppet forces is to deliberately invade the inviolable territorial waters of the DPRK and make a preemptive strike and thus compel the Korean People's Army to take counteraction for self-defence and then paint the DPRK as the chieftain of "provocation" and "threat" by setting in motion reptile reactionary media and push the situation in the hot spot waters in the West Sea to the brink of war"
up to the fact that created a near war situation in the West Sea of Korea and must immediately de-escalate the tensions . What the situation in the West Sea of Korea shows is the correctness of the Songun policy of the DPRK which counters force with force and not by talking. Pyongyang, June 25 (KCNA) -- A decree of the Presidium of the Supreme People's Assembly of the DPRK on instituting the Day of Strategic Force of the DPRK was promulgated on Friday. Kim Jong Il, who successfully carried forward and developed President Kim Il Sung's idea on building the Juche-based rocket force long ago, founded the Strategic Rocket Force, an independent service, on July 3, 1999 to lay a solid foundation for bolstering the nuclear deterrent for self-defence. Pyongyang, June 25 (KCNA) -- The Policy Department of the National Defence Commission (NDC) of the DPRK in a detailed report on Saturday disclosed and denounced the thrice-cursed crimes committed by the sworn enemy given the prevailing situation in the hot spot waters in the West Sea which can be called the epitome of the U.S. hostile policy toward the DPRK and the south Korean puppet forces' policy for confrontation with the DPRK. The report disclosed the sinister nature of the gangster-like U.S. which turned the West Sea of Korea into the hottest spot waters. Back in 1953 when the June 25 war ended in truce, the U.S. moved desperately to create a starting point for a new war. On many occasions such as the 346th meeting of the Military Armistice Committee in December 1973, the DPRK-U.S. general-level talks in Panmunjom in August and September 1999, the U.S. categorically ignored the efforts made by the DPRK side to set the maritime military demarcation line in the West Sea and prevent the military conflict there. The U.S. has been without exception behind the vicious moves of the puppet forces of south Korea to escalate the military tension in the hot spot waters in the West Sea into the estuary of the River Han. Lots of artillery live-shell firing drills in the said waters and the ceaseless intrusion into the territorial waters and air of the DPRK after the fabrication of the "northern limit line" in the West Sea of Korea clearly prove that the U.S. is the arch criminal ratcheting military tension and the danger of conflict in these waters. The puppet Command for the Defense of Northwestern Islands of south Korea which regards the hot spot waters in the West Sea as its operational theatre held a "memorial service" for those who met deaths while running riot in the forefront areas for confrontation with the fellow countrymen and also has been hell-bent on another round of provocation while crying out for "punishment". This was timed to coincide with the farce for taking a posture for putting an end to the "north's provocation" within 24 hours by task forces of the puppet navy and marine corps commissioned in May. From 16th to 18th, dozens of large combat warships of the puppet navy and coastal police staged marine mobile drills with fighters with different missions involved. They also staged air defence drill, exercises for defending the area they are stationed and exercises for countering underwater infiltration while crying out for turning the hot spot waters into the "grave" of someone and escalating military stand-off for the purpose. In fact, the military situation in the hot spot waters in the West Sea has gone beyond the phase of control. A clear proof of it was the reckless military actions committed by the puppet military gangsters on May 27. The provocative marine infiltration is without exception supported by the puppet air force and ground artillery pieces with the involvement of the fully-armed marine groups made up of puppet warships. The sinister aim sought by the south Korean puppet forces is to deliberately invade the inviolable territorial waters of the DPRK and make a preemptive strike and thus compel the Korean People's Army to take counteraction for self-defence and then paint the DPRK as the chieftain of "provocation" and "threat" by setting in motion reptile reactionary media and push the situation in the hot spot waters in the West Sea to the brink of war. The increasing military tension has to be deescalated and the daily mounting danger of military conflict has to be defused at an early date. Traitor Park Geun Hye and her group finding themselves at risk in the face of the worst "administrative" crisis are pushing the situation in the sensitive hot spot waters in the West Sea to the point of explosion at the zealous instigation of their American master. The hot spot waters in the West Sea made us keenly realize in practice the truth that talking would never help achieve peace and only matchlessly powerful arms will ensure genuine peace. Steadfast is the will of the army and people of the DPRK to prevent the danger of conflict in the hot spot waters in the West Sea, improve the north-south relations and defuse tension on the Korean peninsula. Shortly ago, mandarins of the puppet Ministry of Unification of south Korea in the "document on its stand on the June 15 joint declaration" spouted strange sophism that the DPRK's nuclear weapons are violating the main spirit of the north-south agreements and standing in the way of the inter-Korean relations. The south Korean puppet conservative media and the venal "experts on north Korean affairs" are claiming as if dialogue, exchange and cooperation between the north and the south were suspended due to the DPRK's nuclear tests and ballistic rocket launches. This is no more than a cynical ploy of the puppet forces to shift the blame for the bedeviled inter-Korean relations onto the DPRK and justify their policy of confrontation with it and an intolerable mockery of the main spirit of the north-south agreements. It was neither the DPRK's self-defensive nuclear deterrence nor its ballistic rockets that scrapped the main spirit of the inter-Korean agreements and drove the north-south relations into the present catastrophe. The Park Geun Hye regime of south Korea was entirely to blame for this situation as it has been hell-bent on acts of treachery with the daydream of isolating and stifling the compatriots in the north in collusion with outsiders. Nevertheless, the puppet forces are going so impudent as to find fault with the DPRK, raising a hue and cry over "scrapping" and "violation." This is just like a guilty party filing the suit first. The south Korean puppet regime has lost face or qualifications long ago to talk about the north-south agreements as it is bringing the danger of a nuclear war to hang over the nation after reducing south Korea to the world's biggest nuclear outpost. Pyongyang, June 24 (KCNA) -- The director general of the Department of U.S. Affairs of the Foreign Ministry of the DPRK had an interview with the visiting chief of the AP Pyongyang Bureau on Friday on the recent situation on the Korean peninsula and the issue of the DPRK-U.S. relations. Answering questions about the present situation on the peninsula, the director general strongly denounced the U.S. for recently introducing such strategic assets as the nuclear-powered submarine Mississippi and a B-52H strategic bombers formation one after another into south Korea, staging a drill for mounting a preemptive nuclear strike on the DPRK and extremely straining the situation on the Korean peninsula. The director general referred to the DPRK's principled stand that it is left with no other option but to steadily take steps for bolstering its nuclear deterrence for self-defence including nuclear test and missile launch in order to cope with the ever-increasing threat of aggression from the U.S. and its followers. In connection with the test-fire of the surface-to-surface strategic intermediate ballistic rocket Hwasong-10, he said that it is the stand of the DPRK that it should have strong attack means capable of posing constant threat to the enemies in order to firmly protect the security of the country and its people from the threat being constantly posed by the U.S. and other forces hostile to the DPRK. Over the issue of improving the relations with the U.S., he recalled that at the Seventh Congress of the Workers' Party of Korea supreme leader Kim Jong Un urged the U.S. to roll back its anachronistic hostile policy toward the DPRK, replace the armistice agreement with a peace treaty and withdraw its aggressor troops and war hardware from south Korea by correctly understanding the strategic position of the DPRK which has ranked itself among the advanced nuclear weapons states and facing up to the trend of the times. The DPRK is, in my view, a brutal authoritarian regime defined by isolation, repression, famine and a race-based military ideology. The sooner the regime(collaspes) the better. I am replying because I feel your assertions should not be allowed to go unchallenged. Firstly you say "defined by isolation " . Is it not the US , EU and the UK who are the ones creating 'isolation' by virtue of imposing massive sanctions against the Democratic People's Republic of Korea for no good reason. Sanctions which you appear to support by your silence on the issue and your condemnation of the DPRK. Of course sometimes isolation may be the price of being right , the price of standing up for one's self and what is right. The DPRK pursues a policy of independence and is actually acknowledged as such as the most independent . Even former Tory Premier John Major said that the DPRK has "undiluted sovereignty " , Surely this is an achievement , something to be proud of and indeed something to be emulated . As to a "race based " ideology, I do not know what you mean by that. I have studied the Juche Idea for 30 years and it is certainly not a race based ideology rather it is a progressive ideology aimed at achieving man's independence from all forms of subordination . The Juche Idea is profoundly anti-fascist. President Kim Il Sung himself fought Japanese imperialism which was an ally of Nazi Germany and fascist Italy , thus the DPRK was born as a result of the struggle against fascism. The "miltary ideology " you refer to is the Songun (army -first ) policy . It is very nessecary to give priority to the armed forces in the face of the constant threat of US aggression . Iraq, Libya and Yugoslavia show what happens when anti-imperialist regimes weaken their resolve and let their guard down..
[English] DPRK: We Love Peace! considered it couldn't be put off any longer. the people and even by the "National Assembly," would fall in no time. but give a big impact on US imperialism in sparking war in Korea. up the provocation of the Korean war. of a peace treaty with Japan" as alleged in their official statement. • The New York Times, June 20, 1 950 and Ne w York Post, June 28, 1 950. On June 1 7 notorious war maniac Dulles crept into south Korea. Tokyo, pp. 82 and 91 .
visit and finally confirmed every detail of their war plan. "i Who Began the Korean War?, Japanese ed., Tokyo, p. 41. John Foster Dulles' letter to Rim Byong Jik, June 20, 1950.
the last stage with the backing of the US imperialist overlords. ASSPUK, JISGE and UK KFA No to RIMPAC ! We denounce the RIMPAC aggressive exercises of the US imperialists against the Democratic Peoples' Republic of Korea to be staged from the 30th of June to the 4th of August . These are aggressive exercises targeting the DPRK . The biennial RIMPAC joint military exercises are in pursuance of the U.S. imperialists' aggression policy to attain its scenario of stifling the DPRK by blockading it from the sea. The exercises are part of a premeditated plan to the US to not only stifle independent Juche socialism by force but to dominate and control the whole Asia-Pacific region. The exercises are huge in scale as they involve a total of 27 countries , 45 ships, five submarines, more than 200 aircraft and 25,000 personnel and are much larger than beforeRIMPAC is not only a threat to the independence and sovereignty of the DPRK but also a threat to peace in Asia and the world as war in the Asia-Pacific region could spread. We also express concern that the UK is to participate in RIMPAC 2016 Britain must withdraw from such exercises at once .